Examples and applications—including the location of biscuits, foreign bodies, faces, eyes, road lanes, surveillance, vehicles and pedestrians—give the ‘ins and outs’ of developing real-world vision systems, showing the realities of practical implementation. Roy Davies is Emeritus Professor of Machine Vision at Royal Holloway, University of London. He has worked on many aspects of vision, from feature detection to robust, real-time implementations of practical vision tasks. His interests include automated visual inspection, surveillance, vehicle guidance, crime detection and neural networks. He has published more than 200 papers, and three books. Machine Vision: Theory, Algorithms, Practicalities (1990) has been widely used internationally for more than 25 years, and is now out in this much enhanced fifth edition. Roy holds a DSc at the University of London, and has been awarded Distinguished Fellow of the British Machine Vision Association, and Fellow of the International Association of Pattern Recognition. Apart from being very well organised, detailed and complete the 5th edition provides new chapters on Face Recognition, Machine Learning, Deep Learning. 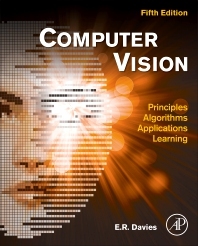 Various aspects of DL and ML from the perspective of Computer Vision are addressed. With detailed focus on EM algorithm, boosting, semantic segmentation and RNN. Also more focus is given on Object Segmentation and Shape Models. Overall I would say a very good book, useful for beginner to advanced level.